For many of us New Year’s Day begins with the tradition of watching the beautiful Tournament of Roses Parade preceding the Rose Bowl Football Game in Pasadena, California. Each year we have marveled at the enormous figures on the floats with intricate designs and wondered how on earth they were covered entirely with real flowers and other plant material in time for the parade. In late December 2016 we got to watch the creating of the floats for the 100th anniversary of this famous parade, begun in 1917. What a thrill! Admission is charged for viewing the floats at the various sites outside or near the Pasadena Rose Bowl Stadium. The four float decorating places are Rose Palace, Rosemont Pavilion, Brookside Pavilion, and the Rose Float Plaza South, in the City of Irwindale, California. 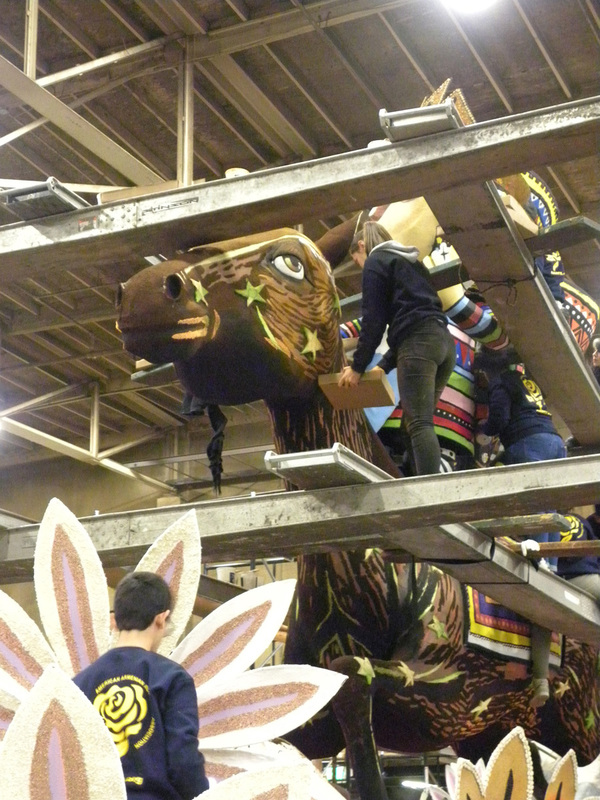 In huge warehouses we watched the hundreds of workers who volunteer to make these impressive and colorful floats. Professional designers and committees are ready with the basic forms of the huge floats set up and waiting for the volunteers who show up from all over the USA and from some other countries to have the enjoyment of saying with pride, “I helped create that one!” to their friends and family as the floats go by on Colorado Avenue, Pasadena, or on TV sets all over the world on New Year’s Day. There were many different work stations set up in each of the barns: glue stations, brush cleaning places, tables of dried flowers, bark, seeds, herbs, spices, grasses, and any other part of nature which could be applied during the two weeks before the big day. 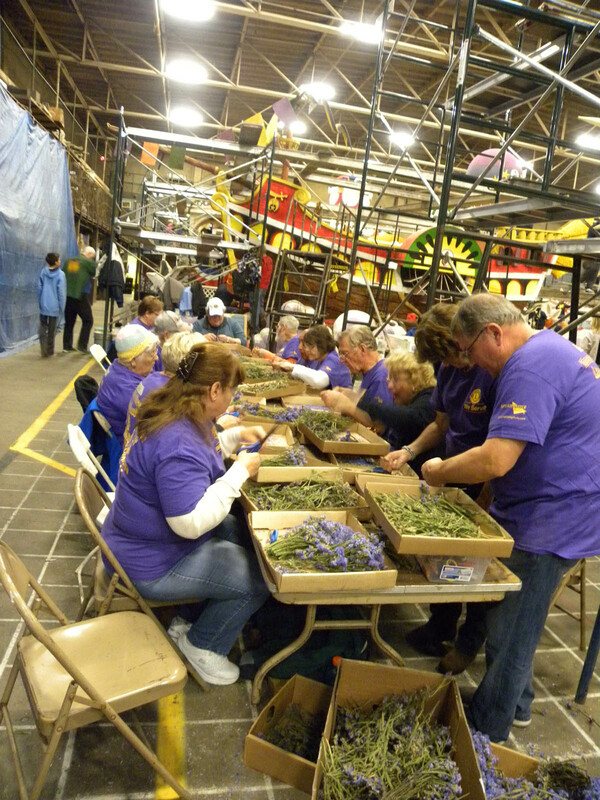 Fresh flowers, which complete each of the floats are applied in the last 48 hours before the parade. 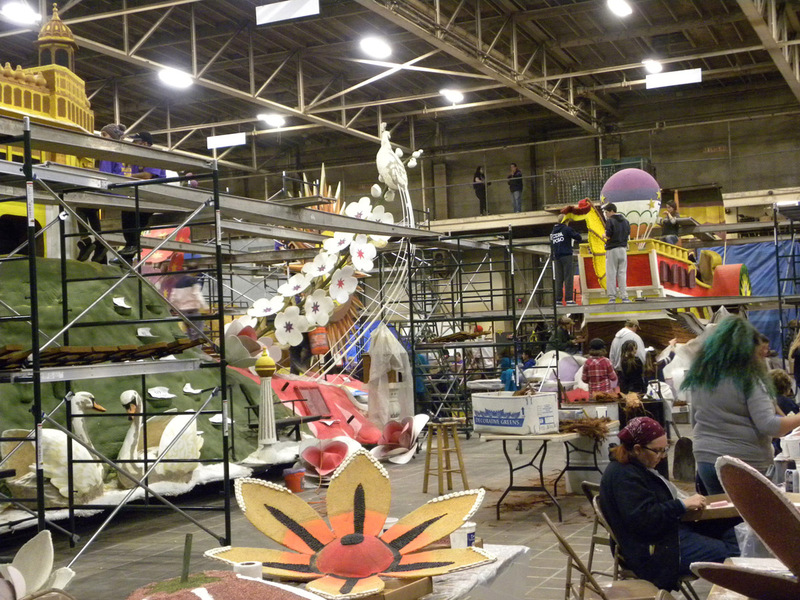 To decorate one float about 60 volunteers work 10 hours a day for 10 days. The group cooperation looks like fun, but the positions they must stay in for some of the decorating looked painful and very tiring! But volunteers ranged from 13 years old to senior citizens and all were happily industrious in applying all their artistic energies to their particular assigned part of the huge floats. In the final decorating hours when the thousands of fresh flowers are applied in small vials as quickly and securely as possible, it takes an amazing 20 daisies, 30 roses or 36 marigolds to cover one square foot of a float area! And approximately a half million roses are used in the parade. Growers from all over the world are necessary to fill and deliver the orders on time. What a fete! It is produced by the nonprofit Pasadena Tournament of Roses Association. I asked how the floats were made in the early days a century ago when planes did not fly flowers in from all over the world. In the early days the Tournament of Roses Parade flowers were locally grown in the Fanny Morrison Horticultural Center to decorate horse-drawn carriages. 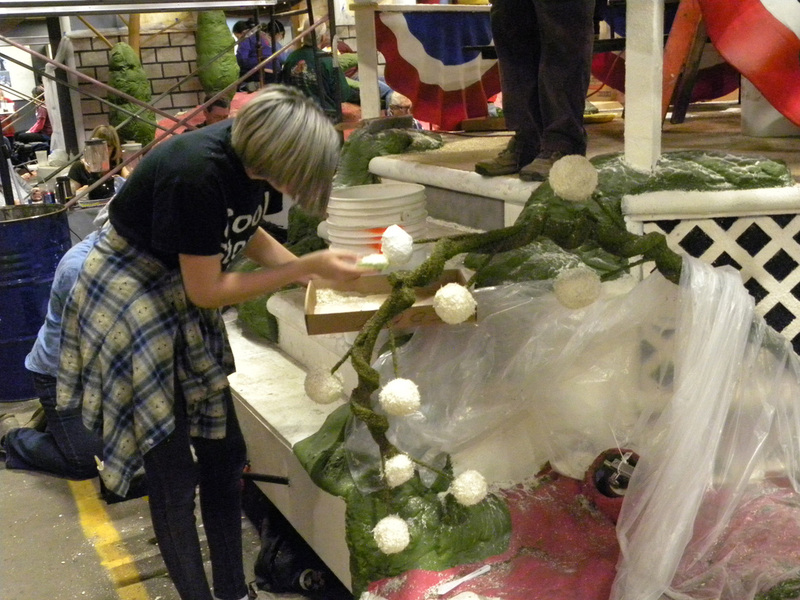 Today professionally designed floats are required to be covered with plant material. Three civic and floral industry leaders judge the floats and award prizes in 24 categories. Awards are announced at 6 A.M. on parade day. Length of parade is 5.5 miles (8.9 km), about 2.25 hours long at 2.5 miles (4.0 km) per hour pace. You can volunteer too! Plans for next year’s floats will begin a few weeks after this year’s glory has been dismantled! And designers and architects start their work and by February the theme for the following year is announced. So begin to plan now to join the volunteer fun which extends from the day after Christmas until the last of December. The Showcase of Floats begins at Sierra Madre and Washington Boulevard in Pasadena. Parking is free, but limited. Last year there is a free shuttle location at Pasadena City College, 1570 E. Colorado Blvd., Pasadena; and the Rose Bowl Stadium Lot B. 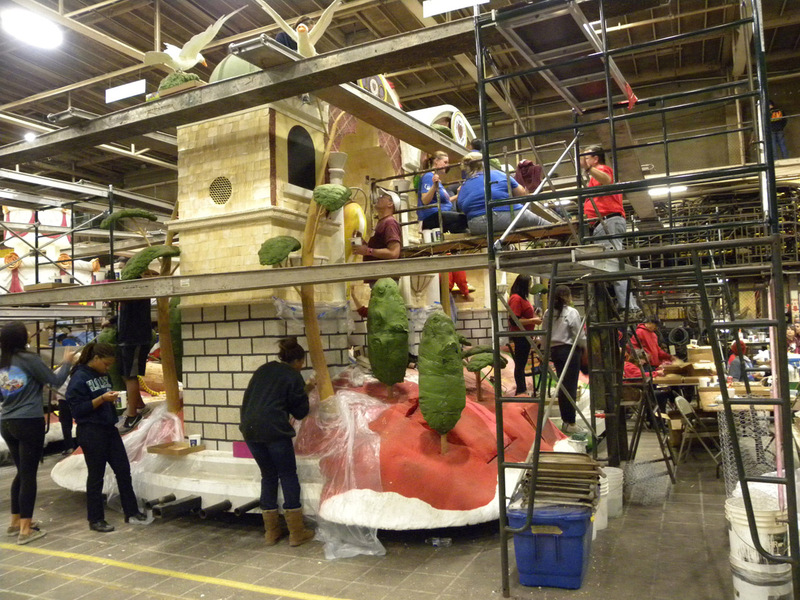 Well before the parade as each float is completed it is moved from the warehouse facility to line up on Orange Grove Boulevard, Pasadena.